Their Britpop rivalry was legendary, but Noel Gallagher and Damon Albarn have put their musical differences aside to perform together in aid of a cancer charity. The Oasis and Blur singers strummed their guitars alongside each other on stage at London's Royal Albert Hall as part of the Teenage Cancer Trust series of concerts, curated by Noel. They were joined last night by Blur guitarist Graham Coxon for a rendition of the band's 1999 hit song Tender, with Paul Weller adding to the star-studded line-up by playing the drums. Fans were delighted by the collaboration, with many taking to Twitter to praise the musicians. Twitter user @areminder wrote: "Noel Gallagher playing Tender with Damon Albarn & Graham Coxon (& Paul Weller) is blowing my 16 year old mind." 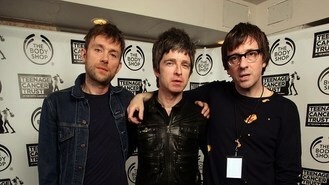 Photographer Yui Mok, who was there to record the moment, described how the collaboration began with Damon calling "Noel?" towards the wings, before Gallagher walked on to the stage. He added: "To the initial chords of Blur song Tender, it seemed like everyone was on their feet and you could feel the temperature in the room rise several notches. "It was one of those moments that are quite few and far between these days, a genuine bit of musical history." The pair shared a microphone for two lines of a chorus, exchanging wide smiles as they sang the song, the last of Albarn and Coxon's set of the night. Fan Catherine Morgan, from Earlsfield, south-west London, said of the performance: "It was electric. Who would have thought you would have seen Damon, Graham and Noel singing Tender, and with Paul Weller on drums! "It sounded great, true rock and roll, and for a great cause." Tony Bennett has admitted he "can't wait" to get into the recording studio with Lady Gaga. Alt-J have revealed they turned down a lucrative deal to feature on an advert for crisps, because they refused to cover Johnny Cash. Hundreds of fans turned out to see the unveiling of the UK's first One Direction pop-up store. Girl group The Saturdays have claimed their first number one single in their six-year career. Adele could be teaming up with Robbie Williams for a song, according to reports. Cheryl Cole is so exhausted by a year of constant work that she is taking a break from showbiz. Ed Sheeran is patching up his recent spat with Noel Gallagher by offering to perform at next year's Teenage Cancer Trust gigs, according to The Sun. My Chemical Romance have decided to call it a day after more than 10 years together.